What kinds of persons do we aspire to be, and how do our aspirations fit with our ideas of rationality? 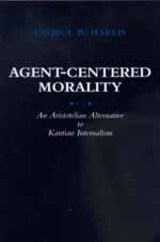 In Agent-Centered Morality, George Harris argues that most of us aspire to a certain sort of integrity: We wish to be respectful of and sympathetic to others, and to be loving parents, friends, and members of our communities. Against a prevailing Kantian consensus, Harris offers an Aristotelian view of the problems presented by practical reason, problems of integrating all our concerns into a coherent, meaningful life in a way that preserves our integrity. The task of solving these problems is "the integration test." Systematically addressing the work of major Kantian thinkers, Harris shows that even the most advanced contemporary versions of the Kantian view fail to integrate all of the values that correspond to what we call a moral life. By demonstrating how the meaning of life and practical reason are internally related, he constructs from Aristotle's thought a conceptual scheme that successfully integrates all the characteristics that make a life meaningful, without jeopardizing the place of any. Harris's elucidation of this approach is a major contribution to debates on human agency, practical reason, and morality. George W. Harris, Professor and Chair of the Department of Philosophy at the College of William and Mary, is the author of Dignity and Vulnerability: Strength and Quality of Character (California, 1997).